We’d love your help. Let us know what’s wrong with this preview of A Harvest of Bones by Yasmine Galenorn. Strange supernatural events have been happening to medium Emerald O?Brien. So now it?s up to her and her friends to delve into the past to reveal secrets of the dead, lay them to rest, and ring in the autumn with a harvest of bones. To ask other readers questions about A Harvest of Bones, please sign up. Nice to see Emerald and the gang again. Also nice to learn more about Irena Finch and her family. RIP Brigit, Brent, and Mab. Congratulations to Emerald and Joe. Hope Sammy will be okay. Can't wait to read One Hex of a Wedding!!!! 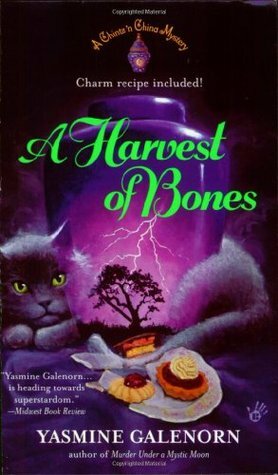 A Harvest of Bones by Yasmine Galenorn is book 4 in her Chintz 'n China Mystery series. In this book we are reunited with Emerald, Kip, Miranada, Joe and all Emerald's friends. Things are going well with Emerald since her last dance with the supernatural and it's coming up on her birthday. Things are going well and everyone is happy. Joe has bought the lot next door to hers and they've been working hard to clear the land of all the brambles that have been growing there for years. 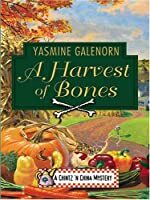 What they don't A Harvest of Bones by Yasmine Galenorn is book 4 in her Chintz 'n China Mystery series. In this book we are reunited with Emerald, Kip, Miranada, Joe and all Emerald's friends. Things are going well with Emerald since her last dance with the supernatural and it's coming up on her birthday. Things are going well and everyone is happy. Joe has bought the lot next door to hers and they've been working hard to clear the land of all the brambles that have been growing there for years. What they don't expect is to come across a ring of bricks that identifies a foundation of the house that once stood there and the basement that still exists but now covered with brambles that have had 50 years to take over. No one thinks much of it until their beloved cat Samantha disappears then a ghost cat that looks a lot like her starts to appear and a young woman's spirit is spotted quite often as well. But that's not all...will o the wisps begin to appear at night as well and they are not anything to play with. There's a lot going on and these spirits want and need Emerald's help to put them to rest. I absolutely love that even though this book is part of a series that it can be read as a standalone novel as well. Emerald is on vacation when we start but she soon gets tired of not being busy when for some reason the sale is halted on the plot next door by the woman who jointly owns it with her brother. Joe is frustrated because he was really looking forward to having it and making future plans with Emerald with it but now those dreams are put on hold and they don't understand why. With Samantha missing the whole family is frustrated and upset behind it but Emerald does her best to keep them hopeful and together. But with the will 'o wisps hovering about and known to be dangerous, Joe experiencing it first hand, Emerald is seeing that there is some danger at afoot and it needs her to step in and help before someone really gets hurt. On exploring the property they find a diary written by a young woman named Brigit who disappeared only to discover her body buried on the property. Now Emerald and her friends and family must come together to discover what really happened and put these haunting souls to rest. For me this is by far my favorite book out of the series so far. You get to see how well each character is written and I really loved that we get some background history on Joe as well from his Aunt. I love Joe and Emerald's chemistry, they just flow together so well and you can tell that they are meant to be together. We even get to see some Karma come back in this story as well which is definitely a bonus but honestly I would have liked to know more concerning the circumstances of what lead to it but maybe we will in the next book. In this book it appears that more than one character is dealing with drama and issues that needs facing and they all do so in good form. The characters are so life like and believable that you honestly just want to travel there to the town and be able to interact with them and live with them. For me this was yet another book that I had a hard time putting down. I am a huge fan of Yasmine Galenorn's and I do love a good mystery and this book definitely fits the bill. Whether you're looking for a good mystery novel, something with a bit of the supernatural or just a huge fan of Yasmine Galenorn this is a book to add to your collection and pick up. You'll most definitely enjoy it. I give this book 5 out of 5 stars and two thumbs up. I, myself, will be adding this book to my own collection and rereading it again and again. I've now read the first four in the Chintz 'n China series and I think this one is my favorite so far. This book encompasses a 50 year old mystery and a lost cat. But all ends well. I adore the characters and have totally bought into the spirit world of Emerald as I've come to love her mundane daily life with her two kids Miranda and Kipling, her love Joe and her friends Murray and Harlowe. I have the next two and can't wait to continue the story. The characters in this series keep getting better. This story was wonderfully poignant and had me reading until way past bedtime! I love that the author throws in little tidbits about the ex getting his just rewards! Looking forward to the next book in this series. Other than Emerald being a little slow on the uptake (the diary gave away the secret but she totally missed it), I really liked this one. I'm a cat person and I love the paranormal so this one hit all my buttons. A Ghost of a tale!! This was by far my favorite of the entire series! Each just got better and better, with details richer and more vibrant. This novel will make you yearn for autumn and all the beauty of the season! You are in for a real spooky read with this one, of all the books so far I have loved this one the most. Emerald has so much going on in her life already, and when you add secret basement, will o wisps, a ghostly cat, and a long lost love, you have the makings of a once again amazing book. Halloween being my favorite holiday, this book is awesome!! Everything about this book hit on just a bunch of my own experience! I enjoyed it immense and I think you will too. Get this one!! LOVED, LOVED, LOVED THIS ONE! MY FAVORITE OF THE SERIES SO FAR. I was totally absorbed with this one. It kept me on the edge until the very last page. Highly recommended. 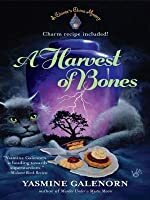 When bones are found from 50 years ago on the lot next door, Emerald and her friends must find out what connection they have to mysterious lights, a restless ghost, and a missing feline. This story is just as great as the last one. Em enjoys life but has come into her own and realized she is happy. Her kids are growing up. Joe is in their lives for good. As a surprise for Emerald, Joe has bought the vacant lot next door. Now they can extend the garden, and make a nice herb garden for her. But first they will have to clean the lot from the brambles that have overgrown it. Em has taken a week of from work, her beloved Chintz ‘n China shop is run perfectly by her two employees in her absence. In a week time, it will be her birthday, on Halloween. While clearing the lot, they stumble upon the foundation of a house, and something dangerous is set fre As a surprise for Emerald, Joe has bought the vacant lot next door. Now they can extend the garden, and make a nice herb garden for her. But first they will have to clean the lot from the brambles that have overgrown it. Em has taken a week of from work, her beloved Chintz ‘n China shop is run perfectly by her two employees in her absence. In a week time, it will be her birthday, on Halloween. While clearing the lot, they stumble upon the foundation of a house, and something dangerous is set free. Especially when they find the body of a young woman, hidden in a tree that has grown around her. Who was she, and how did she and her cat end up in that tree? When even her daughter Miranda sees the ghost in her bed room, Emerald is determined to find out the truth. This will not be so easy when the sale of the lot is revoked and they are denied access to it. But when her kids and her pet are in danger, Emerald doesn’t care about trespassing laws. Em’s daughter Miranda is suffering her first crush, and that is sweet to watch. Kip is being Kip, always in trouble. This time he falls out of a tree when he thinks he sees their missing cat up there. This was a really spooky story, with those will-o’-the-wisps appearing, corpse candles. They are capable of harming people. The mystery was very good though. I did not remember all the details, and I really thought someone else did kill Brigit. I loved how her background story was told, with a page from her diary at the beginning of each chapter. The cat swap was very sad to read about and I was anxious to see that revolved. A really, really good series, recommended. And yes, I did re-read the whole series one after each other. This one brought Irish lore into a great setting of a secret love lost, a diary full of cryptic speak. A thinning veil, letting ghosties in, and someone's past needed to surface to solve this murder, and return the lover that was lost for so very long. Join emerald and her brood in this adventure of digging up secrets or a well to do family to solve a murder of a girl who seemed so lost, and to help bring home her poor kitty who got swapped with a ghostie! Emerald and Joe have really done it this time. Joe has bought a lot covered in weeds and brambles next door to Emeralds home. When they start to clear it out they find the foundation of a home that burned to the ground 50 years ago. When they do, things start to get weird. Emeralds families cat Sammy goes missing, the lot is filled to the brim with Will o'the Wisps, and a ghost of a woman named Brigit and her cat Mab show up. I have to say that this one is my favorite book in the series. This ha Emerald and Joe have really done it this time. Joe has bought a lot covered in weeds and brambles next door to Emeralds home. When they start to clear it out they find the foundation of a home that burned to the ground 50 years ago. When they do, things start to get weird. Emeralds families cat Sammy goes missing, the lot is filled to the brim with Will o'the Wisps, and a ghost of a woman named Brigit and her cat Mab show up. I have to say that this one is my favorite book in the series. This had a darker feel to it due to what happened to Brigit. The kids having to deal with their pet being gone broke my heart into a million pieces. Anyone who has ever had a furbaby get lost knows the desperation you feel when you cant find them. I also got the sense that Emerald grew a lot in this book. Things were changing quickly and she was forced to face some hidden fears. I recived a copy of the book. This is my voulintary review. This book is by far my favorite of the series. The Irish legands, the ghosts. It starts out the Emerald and Joe are trying to clear the lot next door. Then things go haywire. A ghost and her cat shows up. And little Sammy vanishes. Poor Emerald must find out what they want and find her Sammy before its to late. Can she help the poor Spirit and her cat? Will she find Sammy? Read and find out. I love this book for a few reasons. One: we hav I recived a copy of the book. This is my voulintary review. I found this author on a Halloween display set up at my library. I like good natured mysterys, witches and the paranormal, and children. I didn't see any way to lose. I was right. These books are all about fun, with some spooky suspense thrown in to give it a little edge. The best part was the characters, each one individual and quirky. I will probably head out tomorrow to hunt up the rest of this author's book. I enjoyed the combination of supernatural and a real murder in the story. Since this is the fourth book in you would think the main character Emerald would be more confident regarding her psychic abilities, but she came off whiny.That was annoying but her children and the other characters made up for her annoying habit of second guessing herself. I look forward to reading the other books in the series. Great read for the season. . . Yasmine Galenorn spins a tale of the supernatural. Emerald and her friends delve into a harvest of bones when Emerald and her boyfriend begin clearing the lot next door. It is purchased by Joe so they could extend their property. A lost cat, a ghost cat, a young women ghost and Will o' the Wisps really gives the reader a sense of Halloween. This book wasn't too bad. Mystery, romance and fantasty all tied in together. Made light reading, went fast. This is the 4th in a series, wish I had read ther others first, it refers to those stories. New York Times, Publishers Weekly, and USA Today bestselling author Yasmine Galenorn writes urban fantasy and paranormal romance, and is the author of over sixty books & numerous series, including the Wild Hunt Series, the Fury Unbound Series, the Otherworld Series, the Bewitching Bedlam Series, and more.